A breaking news story, brought to you by People’s Daily: Monkeys trained as battlefield killers in Afghanistan. So we’ve got an unnamed ‘British-based media agency,’ an equally unnamed ‘experts,’ as well as a mysterious lack of images depicting these monkey shock troops. The article also left a number of other deeply important questions unanswered — such as, for instance, what variety of monkey the Taliban is using. Inquiring minds want to know. The only primate in Afghanistan other than humans is the rhesus macaque, but Waziristan is in Pakistan, not Afghanistan, so perhaps the source of the monkeys is a bit farther east. If we’re going to include Pakistan as a possible sources for armed monkey terrorists, we can add gray langurs to the list, but for a variety of reasons the Rhesus is a far superior species from which to recruit monkey guerrilla troops. 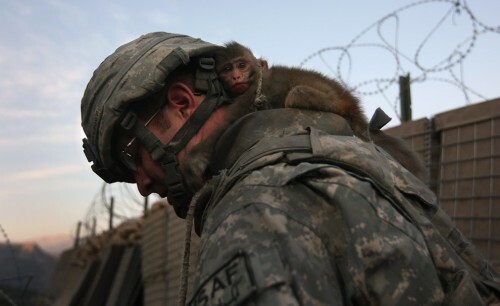 And, as you can see from the adorable photo below, rhesus macaques are already embedded among troops stationed in Afghanistan. Judging from this photo, I conclude that People’s Daily got the story entirely wrong. Armed monkeys are indeed playing a significant role in the conflict in Afghanistan, but it is the U.S. rather than the Taliban that is responsible for recruiting monkey warriors. Despite this, People’s Daily — a Chinese media outlet — is falsely alleging that the monkeys are terrorists, in order to weaken the morale of American troops. In a sense, the emergence of “monkey soldiers” is the result of asymmetrical warfare. The United States launched the war in Afghanistan using the world’s most advanced weapons such as highly-intelligent robots to detect bombs on roadsides and unmanned aerial vehicles to attack major Taliban targets. In response, the Taliban forces have tried any possible means and figured out a method to train monkeys as “replacement killers” against American troops. Analysts believe that apart from using “monkey killers” to attack the American troops, the Taliban also sought to arouse Western animal protectionists to pressure their governments to withdraw troops from Afghanistan. Although I have conclusively shown that the monkey soldiers are in fact part of the American military, the mysterious “analysts” quoted by People’s Daily must believe that the Taliban are a fiendishly clever foe. While we have been at war in Afghanistan for nearly a decade, once PETA gets involved in the anti-war effort, America will be forced to withdraw from the conflict in a matter of weeks. Update #2: A video of a Chinese newscast on the Monkey soldiers has now been released. This entry was posted in Everything Else and tagged experts say, monkey terrorists, rhesus macaques by Susan Simpson. Bookmark the permalink. If only there was some way to touch the monkeys’ hearts and minds. Wait a minute . . . what about bananas?! Has anyone tried bananas?! The Taliban is way ahead of you. Or at least the Chinese CGI-rendered Taliban is. In the video clip, it shows the Taliban waving a banana around near a picture of a US soldier. I’m not entirely certain what this is supposed to be communicating to the chimpanzees. If you see an American, we will wave a banana around at you? American soldiers have bananas, and if you kill them, you can take the bananas from them?